"That's not a bathing suit! I want to see only your bathing suit! Turn around and put your clothes in your locker...now!" This is what I heard as I stepped into the pre-pool shower area of the new McCarren Park Pool wearing a cover-up over my bathing suit. 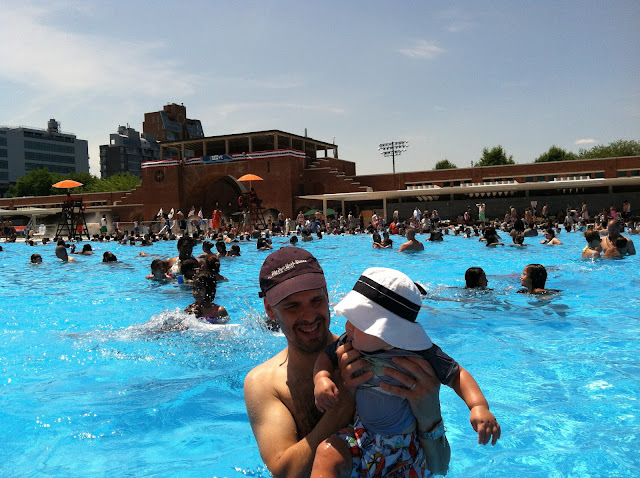 I wondered if the militant yelling were a part of the New York City public swimming pool experience. When Rob and I were reunited in the pool area after being herded through the men's and women's locker rooms, which is mandatory, we compared notes about the yelling from staff and both remarked that this is what certain prisoner camps must be like. There were some good aspects to the pool, though. It's free...there was no line when we went at 12:30 pm one Saturday afternoon...and it was clean! Highlights and useful tips for visiting McCarren Park Pool with babies or kids after the jump!